When you really want to feel a million dollars your make up must be perfect. Sue's expertise will ensure that your look complements your colouring, personality and the occasion. Sue offers 2 options. she will either make you up on the day or teach you how to create that special look yourself with a make up lesson (Beauty Workshop). 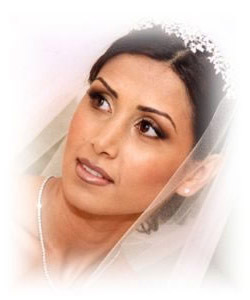 Bridal make up must be perfect for the individual bride. To ensure that you get the look you really want on this very special day, and to look gorgeous in your photographs, Sue will arrange a rehearsal makeup and take a digital photograph at least a month before the wedding. This service can be extended to include the bridesmaids and mothers. A de-luxe all day service can be arranged and Sue will be at hand to touch up and ensure that everyone’s look stays radiant throughout.